There is no such thing as too many flowers when it comes to this stunning style! By choosing soft base colours of blush pink and gold for the tablecloths, centrepieces and chairs, it will allow the flowers to be the real star of the show. Don't be afraid to be bolder in your colour choices for the flowers - adding some deep pinks and bright violet will create a real 'wow' factor for your engagement party! If you're all about keeping it simple with maximum impact, then this is the style for you! A modern take on the highly loved Hamptons look, this style keeps it fresh with crisp whites and an abundance of greenery. Make sure to add some warmth to your colour palette with natural timbers or candlelight to soften the look. There's a reason why white and gold colour palette never go out of style - it is the ultimate in sophisticated style! 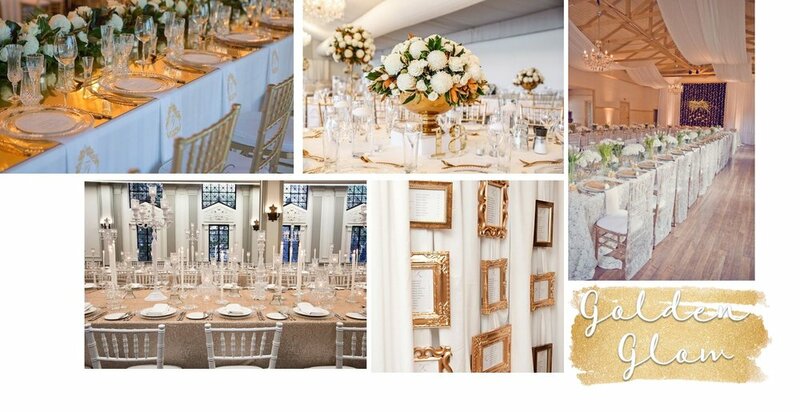 This style is all about balance - think gold Tiffany chairs with white seat pads and white linen tablecloths with gold cutlery and charger plates. Be sure to mix metallic with mirrored gold finishes to create the perfect balance for your engagement party! 'A little party never killed nobody...' but this style inspiration might just take your breath away! 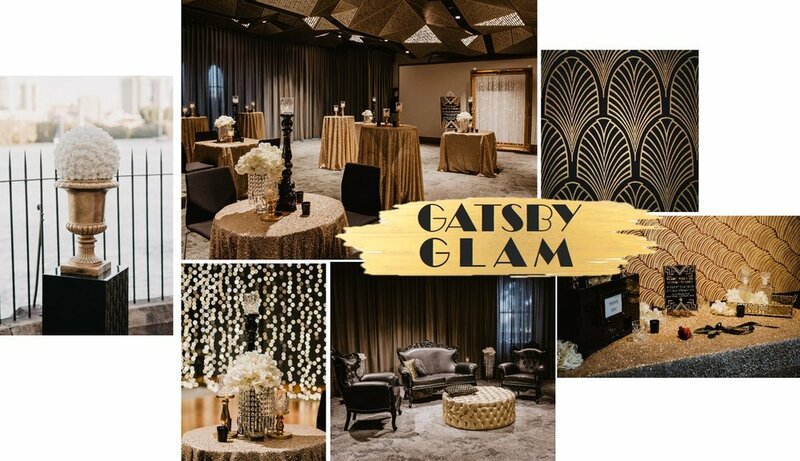 The Gatsby style is all about over the top sophisticated glam - think champagne towers with gorgeous crystal cut glassware, sparkling gold sequin tablecloths contrasted against sleek black lounge furniture. Vintage has never looked so good! Want that relaxed fiesta feel for your engagement party? Then the Mexican fiesta style is for you! Create vibrant centrepieces using succulents and cacti mixed with bright florals to bring this look to life. Make sure to bring in food trucks to serve your favourite Mexican street foods and refreshing mojitos! Finish the look off with some colourful papel picado bunting and you've got one fun fiesta for your engagement party! Forget about your traditional colour palettes for your engagement party! Why not add some colour to your party?! Taking inspiration from the florals, this gorgeous engagement party was filled with the perfect balance of crisp white, sunshine yellow, fun fuschia and bright blue. This perfect balance of colour is created through consistency of all the styling elements - from the furniture to the florals to the centrepieces and even the stationary!